Finally the New Snarky Book Is Out! Wynn Butler is ready to kill her mother . . . or at the very least demand she gets a psych evaluation and an MRI. 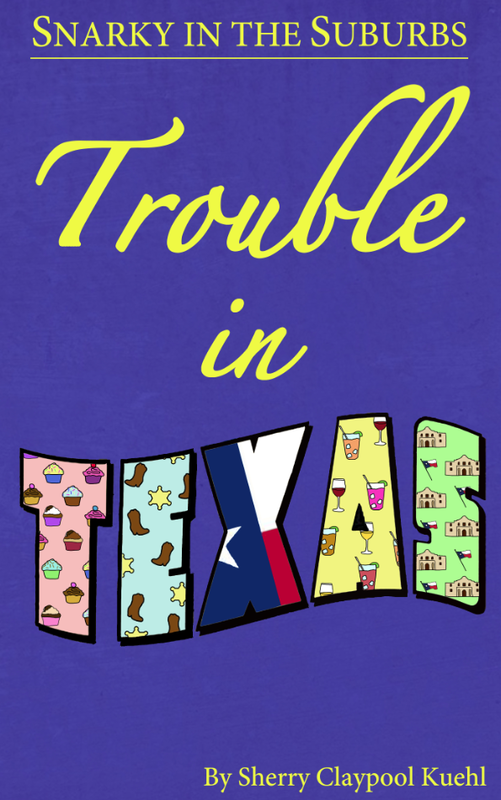 On Wynn’s yearly pilgrimage to Trask, Texas, to visit her parents what she hoped would be a relaxing visit (not counting the family reunion which has all the charm of a zombie apocalypse) has turned into a Texas-sized, hot mess! Her 69-year-old mother Gwynn Crockett Martin has become an entrepreneur and opened up a cupcake bakery that seems to be doing double duty as a halfway house for economically battered Junior League dropouts. If that’s not enough to make Wynn want to turn tail and run home, her mom is hell bent on convincing her to “heed the call of Jesus” and come to the aid of a woman that made Wynn miserable in high school – Sara Beth Bishop. And by aid, Wynn’s mother means concoct a plan to exact epic revenge on Sara Beth’s lying, cheating, spray tanning, money stealing ex-husband and his new wife, snob-of-the-millennium, Yale Greenly. Things go from bad to worse when Wynn finds herself embroiled in a scheme that involves breaking and entering, theft, assault, livestock wrangling, killer mold, impersonating a maid, hair spray bomb fabrication and crashing the town’s poshest society event of the year – THE Mohair Palace Pageant. If Wynn can survive this visit home without doing time in the ER, jail, or both, it will be a miracle! Right at this very moment you can get the book over at Amazon for your Kindle. I’m still waiting for the paperback version to show up on Amazon. I’ll let you know as soon as that happens. You can also get it for you Nook. And for everyone that complained that the first Snarky wasn’t on iBooks I’m waiting for iTunes to give me the thumbs up that it’s available. Meanwhile, you can, for free, download the Kindle app for your iPad or iPhone. A special thank you to Lori Barta Joergensen and Abby Ray! They were Team Snarky for this book and I have a girl crush on both of them. Now, go out there and give Trouble in Texas a lookie loo! So excited!!! I LOVED the first book and I can’t wait to read this one. Got it! It’s now on my Kindle and I’ve going to start reading it right now. I’m already on Chapter 3. I love, love, love it! I know exactly what I’m going to be doing tonight! Reading Snarky. I’m so excited for you! Can’t wait to get into it! Hugs. Texas style!! Thanks! So glad it’s finally out. It looks hilarious. Like a solar nebula blast of heat! Nice to see you here! Thanks Scott! If you read it you’ll recognize a lot of the “fictional” characters in the book. Congrats to you….can think of nothing more exciting!